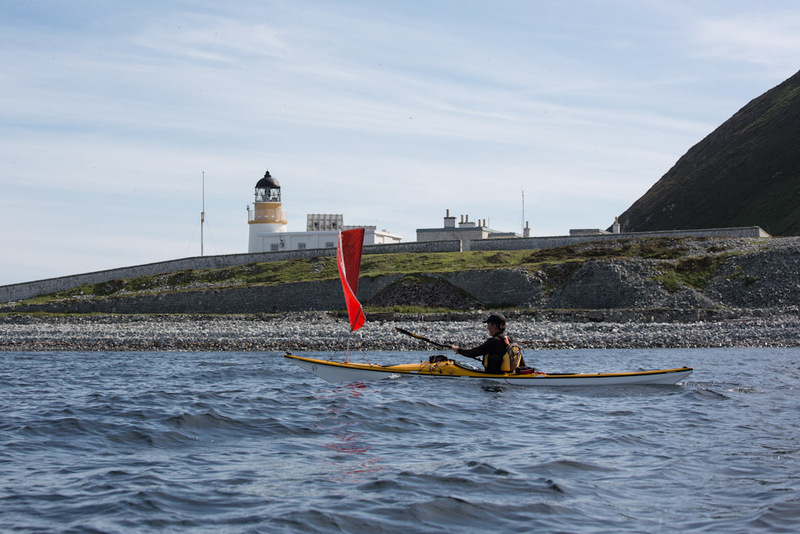 Bearing ferry angles and pain on the Ailsa Craig crossing. 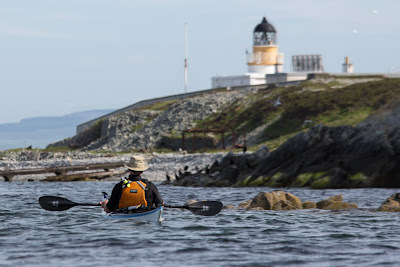 All too soon, we left the incredible sea bird colonies on the western cliffs of Ailsa Craig behind us and found ourselves back at the light house. However, the fun was not yet over. 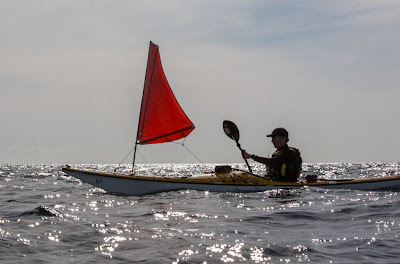 It was time to unleash the sails! 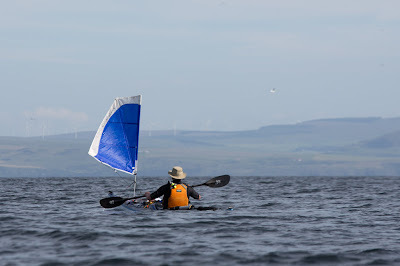 ...soon we were enjoying a fair breeze on the 15km open crossing back to the Ayrshire coast. At least, I should say that Phil and Mike were enjoying it. 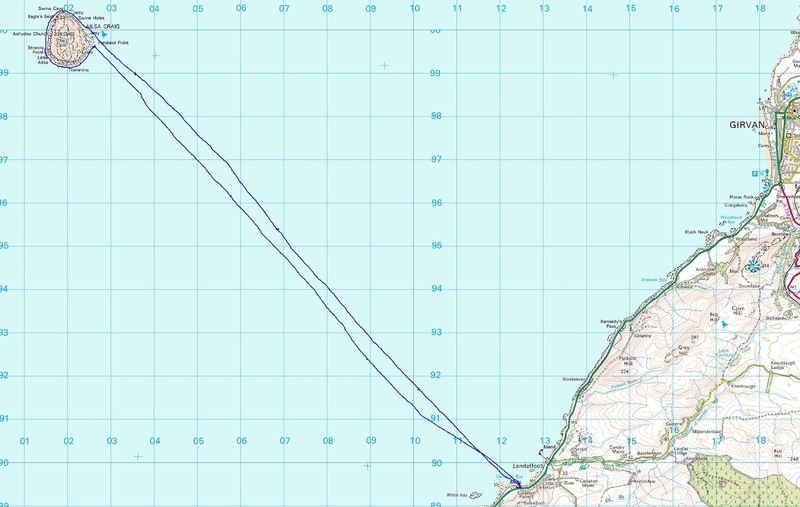 Unfortunately I had hurt my knees and hips in my two falls and I found bracing on a surprisingly lumpy crossing to be very painful. Still it was worth bearing the pain because, as I mentioned before, I could have stayed home and watched TV. Instead, I had enjoyed one of nature's miracles, only an hour's drive from home. Lots of people say there is no tide in the Clyde. 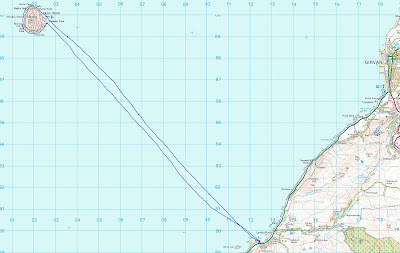 Well to maintain our course on the way out to Ailsa Craig (left hand track) we had to paddle a ferry angle of about 35 degrees higher than the bearing due to the tide carrying us to the SW. You can see where we noticed we were being carried off course and started ferrying, about 2.5km off the Ayrshire coast. On the way out, we were at times paddling towards Holy Island off Arran rather than towards the Craig! Something to bear in mind if you make this fantastic trip.